All-new IBM Q System One targets scientific and commercial use. IBM has revealed how it wants to bring quantum computing out of the lab and to the masses at CES 2019. Speaking at her keynote this morning, IBM CEO Ginni Rometty revealed the company's next step along its IBM Q quantum computing development process, an entirely new system that it hopes can greatly increase the reach and use of the technology. 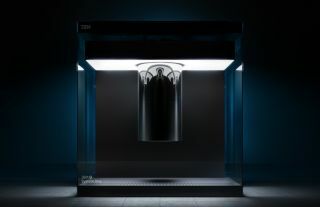 The new IBM Q System One platform is its first integrated universal quantum computing platform and its "most advanced ever", meaning the technology is finally able to break free from the laboratory to help a wider range of organisations than ever before. IBM says that the "world first" 20-qubit system is designed to assist commercial and scientific organisations harness the power of quantum computing, highlighting examples such as financial data modelling or optimising global logistics operations. But along with bringing new levels of computing power, IBM's new release also represents a striking transformation in the look of quantum computing. The hardware is contained in a specially designed 9x9 foot glass case built by Goppion, a world-renowned maker of museum glass display cases that is best known for protecting the Mona Lisa in the Louvre. This case is purpose-built to eliminate outside interference and lengthen the lifespan of quantum computing's units of information called qubits so they survive long enough to perform useful calculations without interference from external sound, vibrations, or temperature fluctuations. There's no news on how much the system will cost, but companies and research organisations will be able to pay to use it via IBM's cloud, with Exxon Mobile and CERN among those already signed up. "The IBM Q System One is a major step forward in the commercialisation of quantum computing," said Arvind Krishna, senior vice president of hybrid cloud and director of IBM Research.